As pharmaceutical companies struggle to improve the success rate and cost-effectiveness of the drug development process, biomarkers have emerged as a valuable tool. 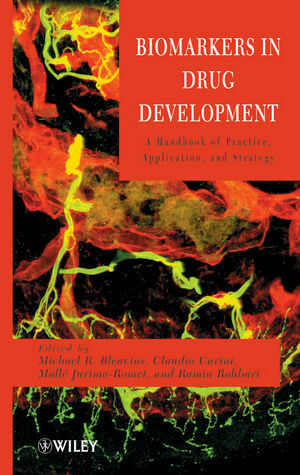 This book synthesizes and reviews the latest efforts to identify, develop, and integrate biomarkers as a key strategy in translational medicine and the drug development process. Filled with case studies, the book demonstrates how biomarkers can improve drug development timelines, lower costs, facilitate better compound selection, reduce late-stage attrition, and open the door to personalized medicine. Part One offers an overview of biomarkers and their role in drug development. Part Two highlights important technologies to help researchers identify new biomarkers. Part Three examines the characterization and validation process for both drugs and diagnostics, and provides practical advice on appropriate statistical methods to ensure that biomarkers fulfill their intended purpose. Parts Four through Six examine the application of biomarkers in discovery, preclinical safety assessment, clinical trials, and translational medicine. Part Seven focuses on lessons learned and the practical aspects of implementing biomarkers in drug development programs. Part Eight explores future trends and issues, including data integration, personalized medicine, and ethical concerns. Each of the thirty-eight chapters was contributed by one or more leading experts, including scientists from biotechnology and pharmaceutical firms, academia, and the U.S. Food and Drug Administration. Their contributions offer pharmaceutical and clinical researchers the most up-to-date understanding of the strategies used for and applications of biomarkers in drug development. MICHAEL R. BLEAVINS, PhD, is cofounder of Michigan Technology and Research Institute. He retired from Pfizer/Warner-Lambert/Parke-Davis in 2006 and has twenty-three years of experience in pharmaceutical research, development, and biomarkers with more than sixty-five peer-reviewed publications. CLAUDIO CARINI, MD, PhD, FRCPath, is Chief Medical Officer and Vice President for Clinical Research at Fresenius. Previously, Claudio served as Global Head of Translational Medicine at MDS and Global Head of Biomarkers at Hoffmann-La Roche. Claudio has more than twenty years of experience in the field of immunology and biomarkers and has authored more than 200 publications in international and domestic peer-reviewed journals. MALLÉ JURIMA-ROMET, PhD, is Senior Director for Development and Regulatory Services at MDS Pharma Services, where she provides strategic and scientific consulting to pharmaceutical and biotech sponsors, and leads drug development program teams. Mallé has authored over forty peer-reviewed publications and is an adjunct professor at the University of Montreal. RAMIN RAHBARI, MS, is cofounder and Senior Consultant at Innovative Scientific Management. Previously, Ramin has held positions at Pfizer, Synaptic, and Parke-Davis pharmaceutical companies, leading cross-functional biomarker teams. PART I BIOMARKERS AND THEIR ROLES IN DRUG DEVELOPMENT. 1 Biomarkers Are Not New (Ian Dews). 2 Biomarkers: Facing the Challenges at the Crossroads of Research and Health Care (Gregory J. Downing). 3 Enabling Go/No Go Decisions (J. Fred Pritchard and Mallé Jurima-Romet). PART II IDENTIFYING NEW BIOMARKERS: TECHNOLOGY APPROACHES. 4 Imaging as a Localized Biomarker: Opportunities and Challenges (Jonathan B. Moody, Philip S. Murphy, Edward P. Ficaro). 5 Protein Biomarker Discovery Using Mass Spectrometry-Based Proteomics (Joanna M. Hunter and Daniel Chelsky). 6 Quantitative Multiplexed Patterning of Immune-Related Biomarkers (Dominic Eisinger, Ralph McDade, and Thomas Joos). 7 Gene Expression Profiles as Preclinical and Clinical Cancer Biomarkers of Prognosis, Drug Response, and Drug Toxicity (Jason A. Sprowl and Amadeo M. Parissenti). 8 Use of High-Throughput Proteomic Arrays for the Discovery of Disease-Associated Molecules (Douglas M. Molina, W. John W. Morrow, and Xiaowu Liang). PART III CHARACTERIZATION AND VALIDATION. 9 Characterization and Validation Biomarkers in Drug Development: Regulatory Perspective (Federico Goodsaid). 10 Fit-for-Purpose Method Validation and Assays for Biomarker Characterization to Support Drug Development (Jean W. Lee, Yuling Wu, and Jin Wang). 11 Molecular Biomarkers from a Diagnostic Perspective (Klaus Lindpaintner). 12 Strategies for the Co-Development of Drugs and Diagnostics: FDA Perspective on Diagnostics Regulation (Francis Kalush and Steven Gutman). 13 Importance of Statistics in the Qualification and Application of Biomarkers (Mary Zacour). PART IV BIOMARKERS IN DISCOVERY AND PRECLINICAL SAFETY. 14 Qualification of Safety Biomarkers for Application to Early Drug Development (William B. Mattes and Frank D. Sistare). 15 Development of Serum Calcium and Phosphorus as Clinical Biomarkers for Drug-Induced Systemic Mineralization: Case Study with a MEK Inhibitor (Alan P. Brown). 16 Biomarkers for the Immunogenicity of Therapeutic Proteins and its Clinical Consequences (Claire Cornips and Huub Shellekens). 17 New Markers of Kidney Injury (Sven A. Beushausen). PART V TRANSLATING FROM PRECLINICAL RESULTS TO CLINICAL AND BACK. 18 Translational Medicine-A Paradigm Shift in Modern Drug Discovery and Development: The Role of Biomarkers (Giora Z. Feuerstein, Salvatore Alesci, Frank L. Walsh, J. Lynn Rutkowski, and Robert R. Ruffolo, Jr.). 19 Clinical Validation and Biomarker Translation (David Lin, Andreas Scherer, Raymond Ng, Robert Balshaw, Shawna Flynn, Paul Keown, Rob McMaster, and Bruce McManus). 20 Predicting and Assessing an Inflammatory Disease and Its Complications: Example from Rheumatoid Arthritis (Christina Trollmo and Lars Klareskog). 21 Pharmacokinetic and Pharmacodynamic Biomarker Correlations (J.F. Marier and Keith Gallicano). 22. Validating In Vitro Toxicity Biomarkers Against Clinical Endpoints (Calvert Louden and Ruth A. Roberts). PART VI BIOMARKERS IN CLINICAL TRIALS. 23 Opportunities and Pitfalls Associated with Early Utilization of Biomarkers: A Case Study in Anticoagulant Development (Kay A. Criswell). 24 Integrating Molecular Testing into Clinical Applications (Anthony A. Killeen). 25 Biomarkers for Lysosomal Storage Disorders (Ari Zimran, Candida Fratazzi, and Deborah Elstein). 26 The Value Chain in the Development of Biomarkers for Disease Targets (Charles W. Richard III, Arthur O. Tzianabos, Whaijen Soo). PART VII LESSONS LEARNED: PRACTICAL ASPECTS OF BIOMARKER IMPLEMENTATION. 27 Biomarkers in Pharmaceutical Development: The Essential Role of Project Management and Teamwork (Lena King, Mall‚ Jurima-Romet, and Nita Ichhpurani). 28 Integrating Academic Laboratories Into Pharmaceutical Development (Peter A. Ward and Kent J. Johnson). 29 Funding Biomarker Research and Development Through the Small Business Innovative Research Program (James Varani). 30 Novel and Traditional Nonclinical Biomarker Utilization in the Estimation of Pharmaceutical Therapeutic Indices (Bruce D. Car, Brian Gemzik, and William R. Foster). 31 Anti-Unicorn Principle: Appropriate Biomarkers Don’t Need to be Rare or Hard to Find (Michael R. Bleavins and Ramin Rahbari). 32 Biomarker Patent Strategies: Opportunities and Risks (Cynthia M. Bott and Eric J. Baude). PART VIII WHERE ARE WE HEADING AND WHAT DO WE REALLY NEED? 33 IT Supporting Biomarker-Enabling Drug Development (Michael Hehenberger). 34 Redefining Disease and Pharmaceutical Targets Through Molecular Definitions and Personalized Medicine (Craig P. Webb, John F. Thompson and Bruce H. Littman). 35 Ethics of Biomarkers: The Borders of Investigative Research, Informed Consent, and Patient Protection (Heather Walmsley, Michael Burgess, Jacqui Brinkman, Richard Hegele, Janet Wilson-McManus, and Bruce McManus). 36 Pathodynamics: Improving Biomarker Selection By Getting More Information From Changes Over Time (Donald C. Trost). 37 Optimizing the Use of Biomarkers for Drug Development: A Clinician's Perspective (Alberto Gimona). 38 Nanotechnology-Based Biomarker Detection (Joshua Reinke).